1. Do I have to pay a Single Supplement? We have never charged a single holiday supplement and will never do! We did actually promise when we started in 1998 and we understood this changing holiday trend, that we will never penalise single travellers. 2. Will I feel lonely on solo traveller holidays or worst don’t have enough time for myself? The balance of cooking, free time and excursions is just right, and as a single traveller in Flavours Holidays, you will to get to know your fellow guests very easily in very comfortable surroundings. Whether you’re used to travelling alone or simply taking some time out for yourself, be sure that our venues are geared towards allowing you to be part of the group when it suits and striking out on your own when you want to. 3. What other activities will I enjoy on my holiday? 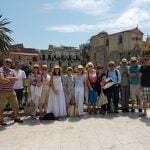 Joining a Flavours holiday is generally not just a typical touristic experience as it involves travelling with a purpose and the opportunity to see the genuine and local face of Italy. Our local, Italian hosts have lived both in the UK and abroad and know exactly what to do to avoid making our guests feel like tourists. They will always be by your side and organise trips to wine tastings, local food producers and market visits and sites of cultural interest. We tend to have different age groups joining Flavours solo traveller holidays. As we understand that it is important to be with like minded people we always do our best to match ages so we always make sure that you will be in the same age group with your fellow single travellers.Our guests are from all over the world! We are very popular to UK travellers but we also have lots of international guests mostly from USA, New Zealand, Australia, Canada and South Africa. Overall an excellent and very enjoyable experience. Flavours team provided friendly and very good service. Accommodation and surroundings excellent.